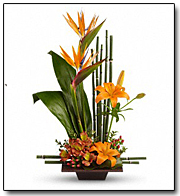 Birds of paradise, asiatic lilies, alstroemeria, red hypercium, accented with ti, hosta and galax leaves arrive in a beautifully exotic keepsake bamboo container. 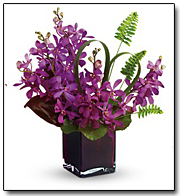 Approximately 16 1/2 W x 25 H.
Purple mokara orchids, flax, fern and red ti leaves and tropical greens are stylishly arranged in a stunning plum cube vase. 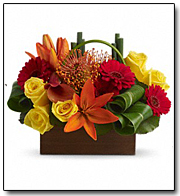 Make someone special feel like a princess today! 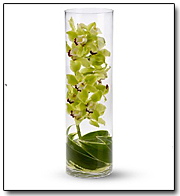 Approximately 13 W x 17 H.
Gorgeous green cymbium orchids and ti leaves stand tall in a striking glass cylinder vase. 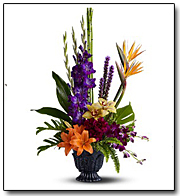 Approximately 6 W x 19 H.
White calla lilies, kale and tropical greens are delivered in a natural bamboo dish. 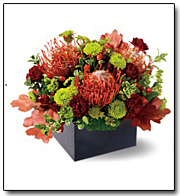 Makes a grand gift! 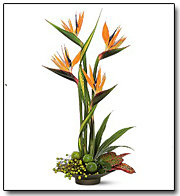 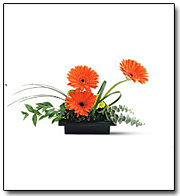 Approximately 15 1/2 W x 25 1/2 H.
A mix of fresh flowers and tropical elements such as Asiatic lilies, orchids, gladioli, Birds of Paradise, Xanadu Philodendron and Aspidistra leaves and liatris.